SABio is an official distributor of Vegenics products in Singapore. •	Measured by surface plasmon resonance recombinant human VEGF-D binds to immobilised VEGF-R2 and VEGF-R3 receptor with an apparent KD <5nM. (Note competitors VEGF-D that is predominately in the monomeric form showed no binding to the receptors). VEGF-D is a member of the VEGF family of secreted glycoproteins that are critical mediators of angiogenesis and lymphangiogenesis2,3. The VEGFs bind to VEGFR-1 (Flt-1), VEGFR-2 (KDR/Flk-1) and VEGFR-3 (Flt-4), a family of structurally related receptor tyrosine kinases that are predominantly expressed on the endothelial cells of blood and/or lymphatic vessels2. The VEGFs have distinct receptor binding specificities which contribute to their diversity of function. VEGF-D was first described in the mouse as a c-fos-induced growth factor (FIGF)4 and subsequently identified in the human1. 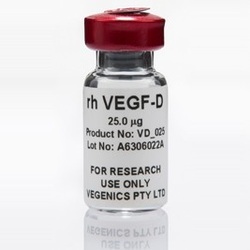 VEGF-D is synthesised as an immature protein consisting of the receptor binding domain (VEGF homology domain, VHD) flanked by amino and carboxyl-terminal propeptides1. Proteolytic processing by serine proteinases including plasmin5 and proprotein convertases6 remove both propeptides to yield the mature form of the protein, a VHD homodimer. As a consequence of processing the affinity of the mature form of VEGF-D for its receptors is substantially increased7. VEGF-D induces angiogenesis via the activation of both VEGFR-2 and VEGFR-3, and lymphangiogenesis via activation of VEGFR-3. VEGF­D is expressed in adult lung, heart, muscle and small intestine, and is most abundantly expressed in foetal lungs and skin7,8, where it is thought play a modifying role in lymphangiogenesis during embryonic development. In the cancer setting VEGF-D promotes solid tumor growth and lymph node metastasis9, and is a poor prognostic marker for colorectal10, ovarian11, prostate12, gastric13 and lung14 cancers. In addition VEGF-D has been shown to have a role in the lung disease Lymphangioleiomyomatosis (LAM) and is a marker for evaluating disease severity15,16. Achen M, et al. (1998) Vascular endothelial growth factor D (VEGF-D) is a ligand for the tyrosine kinases VEGF receptor 2 (Flk1) and VEGF receptor 3 (Flt4). Proc. Natl. Acad. Sci.95 (2):548–553. Veikkola T, et al (2001) Signalling via vascular endothelial growth factor receptor-3 is sufficient for lymphangiogenesis in transgenic mice. EMBO J. (20):1223-1231. Rissanen, T, et al. (2003) VEGF-D is the strongest angiogenic and lymphangiogenic effector among VEGF delivered into skeletal muscle via adenoviruses. Circ Res 92: 1098-1106. Orlandini M, et al. (1996). Identification of a c-fos-induced gene that is related to the platelet-derived growth factor/vascular endothelial growth factor family. Proc. Natl. Acad. Sci. USA 93(21):11675-11680. McColl, B. et al. (2003) Plasmin activates the lymphangiogenic growth factors VEGF-C and VEGF-D. J. Exp. Med. 198:863-868. McColl, B. et al. (2007) Proprotein convertases promote processing of VEGF-D, a critical step for binding the angiogenic receptor VEGFR-2. FASEB J. 21:1088-1098. Stacker SA, et al. (1999) Biosynthesis of Vascular Endothelial Growth Factor-D Involves Proteolytic Processing Which Generates Non-covalent Homodimers. J Biol Chem. 274(45): 32127–32136. Roy H, et al. (2006) Biology of vascular endothelial growth factors. FEBS Lett 580:2879–87. Stacker SA, et al. (2001) VEGF-D promotes the metastatic spread of tumor cells via the lymphatics. Nature Medicine 7 (2):186-191. White, J. et al. (2002) Vascular endothelial growth factor-D expression is an independent prognostic marker for survival in colorectal carcinoma. Cancer Res. 62:1669-1675. Yokoyama, Y. et al. (2003) Vascular endothelial growth factor-D expression is an independent prognostic marker for survival in epithelial ovarian carcinoma. Br. J. Cancer 88: 237-244. Stearns, M. et al. (2004) Expression of a flt-4 (VEGFR3) splicing variant in primary human prostate tumors. VEGF D and flt-4t(Delta773-1081) overexpression is diagnostic for sentinel lymph node metastasis. Lab. Invest. 84: 785-795. Schimanski, C. et al. (2011) VEGF-D correlates with metastatic disease in gastric cancer patients undergoing surgery. World J. Surgery 35(5): 1010-1016. Bo. C. et al. (2009) Expression of vascular endothelial growth factors C and D correlates with lymphangiogenesis and lymph node metastasis in lung adenocarcinoma. Thoracic Cardio. Surgeon. 57(5): 291-294. Seyama, K. et al. (2006) Vascular endothelial growth factor-D is increased in serum of patients with lymphangioleiomyomatosis. Lymphat. Res. Biol. 4:143-152. Glasgow, C. et al. (2009) Serum vascular endothelial growth factor-D levels in patients with lymphangioleiomyomatosis reflect lymphatic involvement. Chest 135: 1293-1300.